We've opened the Vault once again, bringing our ever-popular Flower shoulder bag back for a limited time. This effortless grab-and-go gem has a deep rooted Brahmin history, designed by co-founder and original designer Joan Martin, its structured bucket shape stands as a true testament of timeless style; a top-seller then and perfectly on trend now. Today's Flower bags (pictured above) were designed and manufactured entirely in our Fairhaven, Massachusetts factory and finished with Brahmin's original medallion. Available on our website and in Brahmin Boutique stores from March 8, 2014 to March 31, 2014 in a variety of leathers. 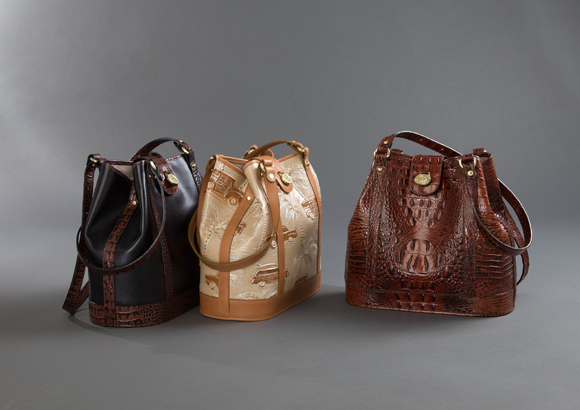 The Flower bag (pictured far right) in its earlier days alongside other past Brahmin favorites. Another version of an earlier Flower bag (pictured center) in smooth leathers. 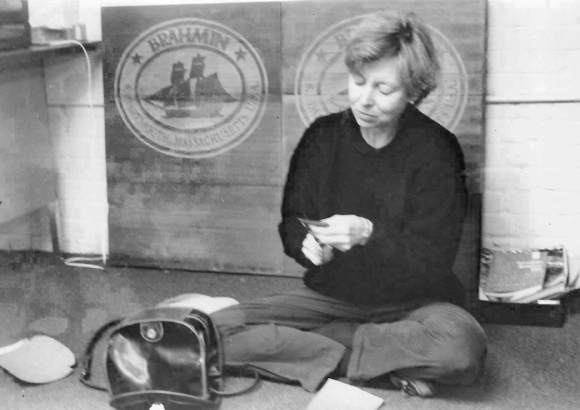 Joan Martin behind the scenes creating Brahmin Magic, cutting pieces of leather for the final finishing touches on one of her many lovely designs. Posted on March 7, 2014 by Brahmin Handbags.